Protesters threw homemade firebombs and chunks of concrete smashed off buildings and pavements against riot officers in downtown Athens on Thursday, during a march marking the 10th anniversary of the deadly shooting of 15-year-old Alexis Grigoropoulos by a policeman in the central Exarchia district. Hundreds of high-school students attended the rally in memory of the slain teenager, whose killing in December 2010 sparked a week of violent riots in Athens and other Greek cities. A group of self-styled anarchists broke away from the main march to start smashing pavements and buildings around Korai Square with sledgehammers, creating ammunition to use against a large contingent of riot officers dispatched to police the rally. Officers responded with tear gas, temporarily dispersing the rioters as the march headed to Parliament. 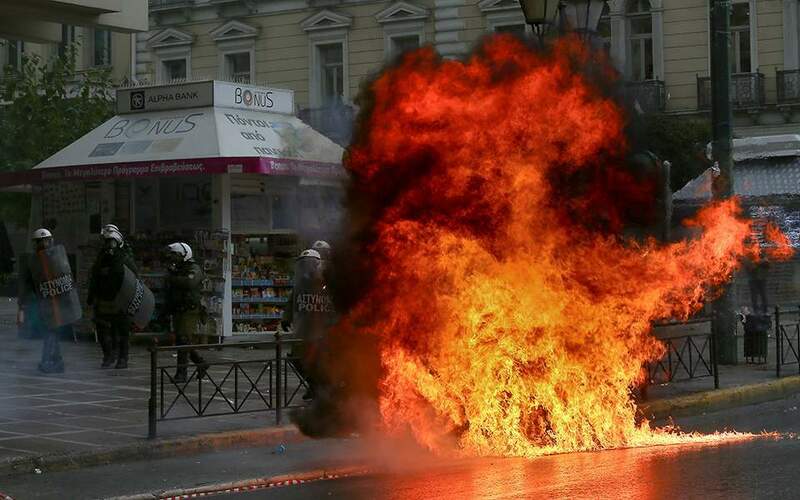 Police in Athens are on high alert for such violence, particularly during a rally planned later in the afternoon by far-left groups from the Propylaia of Athens University to the spot where Grigoropoulos was killed. Meanwhile, in several interviews given earlier this week on the occasion of the anniversary of her son's death, Gina Tsalikian issued a plea for Alexis's killing not to be used as an excuse for more violence and denied suggestions that the 15-year-old boy had connections to the anarchist movement. “Alexandros was against violence, he condemned violent acts and destruction. He would never want his name to be associated with such incidents,” she said on Open TV's evening news program on Wednesday. Riots similar to that which broke out on Thursday “sully my son's memory,” Tsalikian told Antenna television in a separate interview.